Shut The Fridge: I'm The Map, I'm the Map....I'M THE MAP! We use a huge trucker atlas when we travel....even though we also have a GPS....we don't always trust that new fangled technology, you know. We do a lot of geography related Sporcle quizzes. I even decorated our dining room with maps when we first moved into our house because the colors were pretty. It also helped with school lessons or when we were planning vacations around the dinner table. The one problem we seemed to have with maps is when it came to lesson time and putting together map quizzes for the kids. Especially if we were studying something that wasn't necessarily included in our actual curriculum. Even something like a State capital quiz. We would end up searching and searching the internet, trying to find that perfect map that showed just what we needed it to. Usually we still ended up whiting out certain things or adding our stuff onto them. Of course we never remembered to keep a master copy so when the next kid in line covered the same material....the search started all over again. So, this review product, from Knowledge Quest called Map Trek was something we were really interested in trying out. Their whole idea is that history will make sense if you use timelines AND, the right maps for the time. I think Rainman was the most excited to find this product.....because, honestly, he is the one that spends most of the time searching on-line for just the right map. This has just about every map imaginable available to you. You know when you are doing some history lessons and you say...."Well....the country isn't called that anymore....or that country used to be part of ________________, but, um, I think it is called ___________ now...but I'm not really sure...."
They have maps from different time periods that show the borders and areas as they were then...so you can compare them to now. 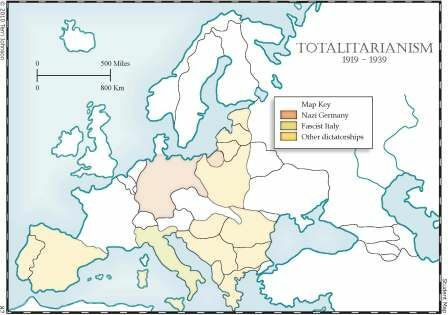 Or, like the example below what was happening in Europe between 1919 and 1939. You could use the Map Trek maps as their own geography lesson, but they work really well with some of the homeschooling curriculum that is out there. For some curriculum they even provide a free "curriculum integration guide" We used the Map Tek maps with our Sonlight US History program. 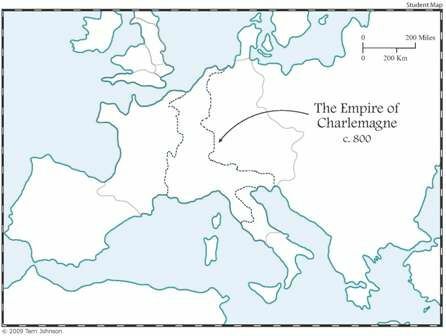 The map below shows just where Charlemagne's empire was and which countries it covered. We just used the US maps this summer, but I can already imagine the possibilities during the school year. Like when we are working on British Literature...we can take a look at the world during Shakespeare's time compared to Emily Bronte, or even to J.K. Rowling. All in all, this is awesome product that will save Rainman countless time and will save me from countless headaches because I have to listen to him complain about not being able to find what we need. I am excited that we will have these maps ready to go for everything that we are working with in history for all the kids. Especially the ones that correlate with our existing history and geography curriculum. But, also for the other map stuff that may will need, like what Palestine looked like at the time of Christ (30 AD). You never know when you will need to know about the 1st, 2nd, 3rd, and 4th Crusades (1095-1204). Right? We just printed off the maps as we needed them. They purposely made the maps with light ink colors, so it won't cost you an arm and a leg to print them off. 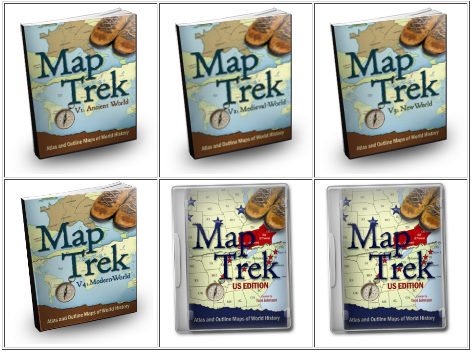 You can get the Map Trek complete six e-book set for $47. They also have a hardcover atlas that comes with CD for $55. Go to Knowledge Quest's webpage and you can get a free e-book called Globalmania - How to Master World Geography in 7 Months or Less. If you still aren't sure about these maps and what they can do for you at home, you can download a 47 page sampler pack from Knowledge Quest. See what other Review Crew members thought of Map Trek. Disclaimer: I received the complete six e-book set from Map Trek for free in exchange for an honest review.